Near glacial maxima, archaic humans could have walked to Japan, so they surely did. Elephants made it. Most of the time, even in the ice ages, Japan was fairly isolated. 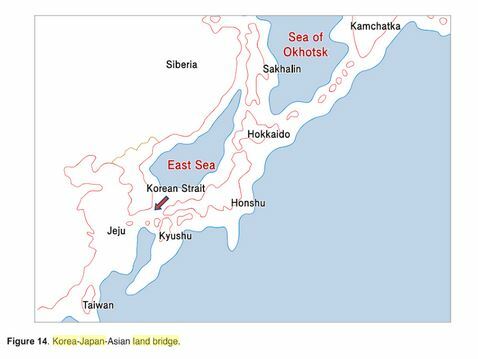 Maybe the northern path through Sakhalin was open (although glaciated) , but most of the time water separated Korea and Japan. There must have been versions of homo erectus and Denisovans in Japan. They haven’t been found, but I think people haven’t looked much.. It used to be assumed nobody lived in Japan before the Jōmon, so people didn’t dig before the Jōmon stratum (14,000 BC). But there must have been archaics there, back in the Paleolithic. Maybe ten years ago, Henry was analyzing some retrotransposons, sequences that randomly make and insert more copies of themselves. These mutations are statistically simpler in some ways that nucleotide substitutions: insertions are unique. Henry had gotten some sign reversed while I was distracting him, so for a moment it looked as if modern humans had originated in Southeast Asia, instead of Africa or nearby. So the new task was to come up with a scenario that might explain that. I was in a silly mood, which helped: took me about a minute to suggest that some of the Indonesian islands and their neighbors went back and forth between between being accessible during deep glacial maxima ( low sea levels, Indonesian archipelago turns into Sundaland) and separated most of the rest of the time: allowing for occasional colonization by archaic sapiens, isolation and local adaptation, maybe even speciation. Since then we’ve found signs of Denisovan admixture in people in Melanesians ( PNG, Australia, the Solomons), hobbits on Flores, other little guys in the Philippines, and old tools in Sulawesi. Very likely we’re going to find Sulawesi man. I wouldn’t be surprised to see five or more separate archaic pops in those islands. Maybe derived erectus, maybe something earlier, maybe highly differentiated Denisovans, maybe all of the above and a few dark elves. I still don’t think they made to Australia, but I wouldn’t bet my life on it. While it looks as if Neanderthals made it to Crete. Since there were land bridges to Japan in glacial maxima, you’d have to to suspect that they had their own local archaic populations as well. To a decent approximation, if elephants could colonize a place, so could archaic humans. If Amerindians had a lot fewer serious infectious diseases than Old Worlders, something else had to limit population – and it wasn’t the Pill. Surely there was more death by violence. In principle they could have sat down and quietly starved to death, but I doubt it. Better to burn out than fade away. There are a few small children, mostly girls, that learn to read very early. You read stories to them and before you know they’re reading by themselves. By very early, I men age 3 or 4. Does this happen in China ? as long as environmental ( or genetic) perturbations aren’t too large, they have little effect. Makes sense: developmental sloppiness would generally reduce fitness. This varies with particular traits: under various kinds of stress, you would expect natural selection to particularly favor canalization of traits that are important to fitness. Maybe intelligence is more important to fitness than height? Shared environment generally has little effect on adult intelligence. Canalization? Or consider Stuart Ritchie’s work suggesting that extra years of school increases intelligence: considering canalization, I doubt it. Educational experts naturally consider canalization when considering new educational interventions. That’s a joke, son.